Dr. Rafie became a dentist because his dad was a dentist and because of his desire to help people. He met his wife while in dental school, and she continues to work in the Granada Hills office. His partner, Dr. Koshbin, is his sister-in-law and both enjoy working in a compassionate, family practice. They strive to provide the best experience possible for their patients at the dentist office, listening and accommodating the needs of the patients. An active member of the American Dental Association, Dr. Rafie also belongs to the California Dental Association and the San Fernando Valley Dental Association. He graduated with honors from Beverly Hills High School and later attended UCLA. 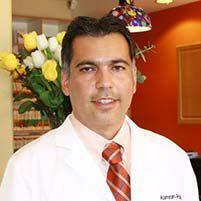 Dr. Rafie received his degree in dentistry from the University of Southern California in Los Angeles. He’s been practicing in Torrance since 2002. Using the latest technologies, Dr. Rafie believes in providing the best dental care for his patients at affordable prices. When not assisting his patients, he enjoys driving, tennis, basketball, and soccer. Dr. Rafie also loves to hike, travel, and spend time with his wife and their two teenaged children. He speaks several languages, including English, Farsi, and Spanish.